Exchange students at the Faculty of Social Science may select courses and modules from any degree programme offered by our and any other faculty. Students enrolled at RUB can attend lectures and seminars at the partner institutions without additional cost (also a public transport ticket is issued automatically upon matriculation). Cafeteria workshops provide an introduction to methodological research approaches. This includes sessions on analysis tools such as Stata or MaxQDA as well as topics in the field of research design. Our internship and career counselling office invites alumni to explain their own career paths and show current students new possibilities in regard to what a degree in Social Science can lead to. The project offers research related consultation and seminars to students planning on writing an empirical (quantitative and qualitative) Bachelor or Master thesis. Our alumni association promotes networking and dialogue between students, graduates and teachers and organises several events, excursions and workshops throughout the semester. LANGUAGE CLASSES - usual language classes and classes for academic writing in foreign language. WRITING AID CENTER - Peer Counselling and Workshops (also with CP) and more, including „Scientific term papers in German as a foreign language“. CAREER SERVICE - Workshops and Counselling that may help you find a job, an internship or new approaches to career planning (including “Applying for jobs in Germany”, held in English). SPRACHCAFÉ - LANGUAGE PRACTICE MEET UP - an ideal meeting point for everyone interested in practicing and improving one‘s own foreign language skills and meeting people from all over the world. UNIVERSITY SPORTS - 350 sports courses of 90 different kinds of sport: from badminton to windsurfing. CENTRE OF THE ARTS - courses and events in various artistic disciplines. Bochum is situated in the heart of the Ruhr area - a metropolitan area with fascinating urban culture of unique dynamics. Once one of the most important industrial regions in Europe, the region has reinvented itself to become one of the Europe's most important centres of education, science and research. Bochum has undergone considerable changes as well. From what was once a coal mining town, the city has evolved into a key scientific centre and a site brimming with culture. Industrial giants have been transformed into thriving new spaces for leisure activities, art and culture. It is these that shape the image of a major, modern city, promising exceptional experiences to international students. 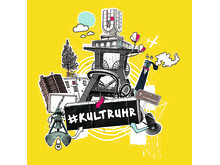 More information on culture in Bochum can be found in the Guide of International Office and at the University portal. 2017 Ruhr-Universität celebrated its annual summer festival for the 43rd time. Each year countless activities and events take place on this day, e.g. concerts, a Street Food Festival, the "University Run" of 5 and 10 km as well as spectacular fireworks. Kemnade Lake is a popular destination for sailors and surfers, but also cyclists, skaters and joggers. Each summer an open air event "Kemnade in Flames" offers numerous live concerts, a Street Food Market and fantastic fireworks. Every year hundreds of thouthands of visitors enjoy the festive atmosphere at one of the best Christmas markets in the Ruhr region: over 200 lovingly decorated stalls, a medieval market square, traditional Christmas music and shining lights. Networking is a keyword for ERASMUS. With the buddy-programme of the faculty you will get to know local students, who may not just give some useful tipps for the studies, but also show you the city from their special perspective! Find out more and apply here. ESN is the biggest students' association in Europe and ESN Bochum is the oldest ESN section in Germany. Since nearly 25 years it organizes different events: cultural evenings, trips, parties, regulars' tables, Social ERASMUS projects to make your stay in Bochum an unforgettable experience!